Editor’s note: Jenny White is professor of anthropology at Boston University and author of Muslim Nationalism and the New Turks. The views expressed are her own. Turkey is doing well these days. Its banks are solid and, according to the International Monetary Fund, it has the 17th largest economy in the world. As a result of the European Union accession process, Ankara has changed hundreds of its laws and institutions to align them with Europe. Parliament is writing a new constitution to replace the one written under military oversight after the 1980 coup, and many hope it will enshrine liberal individual rights. So why have tens of thousands of Turks across the country risen up and taken to the streets, battling the police and demanding that Prime Minister Recep Tayyip Erdogan resign? The protest was ignited by the uprooting of trees in Gezi Park, the only remaining green space in Istanbul’s central Taksim area, to make room for a mall. But it was never just been about the trees. Superficially, these protests could be put down to secular Turks protesting attacks on their lifestyle by the Islam-rooted Justice and Development Party (AKP) government, including recent restrictions on the sale and advertising of alcohol and a Turkish Airlines ban on flight attendants wearing red lipstick. 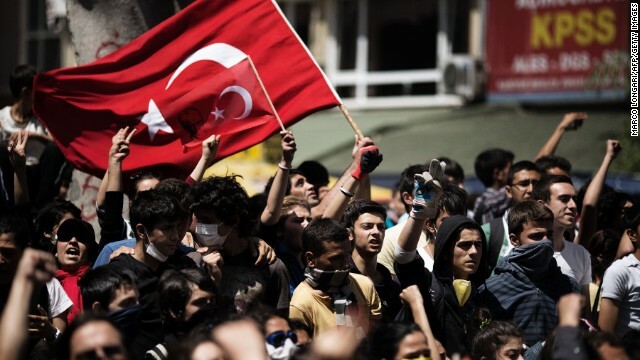 But that sort of analysis trivializes the much deeper and systemic problems that afflict Turkey – and it doesn’t explain the breadth and depth of the protests that quickly spread from cosmopolitan Istanbul to cities across the country, including some of Turkey’s more conservative regions. Yesterday, a 22-year old protester was killed by police in Antakya, a city near the Syrian border in Turkey’s conservative east. Street battles continue today in areas of Istanbul and Ankara. The police have been shooting gas canisters into the crowds indiscriminately and often at close-range, causing serious injuries. Hundreds of protesters have been arrested. Gezi Park has become emblematic of a much larger malaise and discontent with the increasing autocracy and authoritarian attitude of the ruling party, its disregard for the wishes of the population on many issues, including grandiose urban development schemes that are despoiling the environment and erasing entire historic neighborhoods. Such construction projects are often led by government linked companies like TOKI, and have provoked accusations of corruption. So for some, Gezi Park was simply the last straw. Many Turks (and, according to a top government official, even members of the AKP) disagree with the government’s Syria policy, particularly with the AKP’s support of al Qaeda-linked and other radical jihadis who are allowed to enter Turkey and cross into Syria at will. An opposition MP from Hatay, the region bordering Syria, told me that Turkey’s Alevis (a syncretistic Muslim sect that differs from Syria’s Alawites, though also has connections to Shi’ism) are leaving the border region in fear of the jihadis. They are also worried that, as the Syrian conflict becomes more and more a fight between Sunni and Shiite factions, Sunni Turks will turn against their fellow Alevi citizens. Even for pious AKP supporters, bringing foreign jihadis onto Turkish soil may have been a step too far. Grievances abound. Some nationalists are unhappy about the government’s recent peace deal with the separatist Kurdish PKK. Women are enraged by statistics showing an enormous increase in deadly violence against women, while the government closes down women’s shelters and encourages women to stay at home and bear at least three children. At present, Turkey has more journalists in jail than any country in the world and the media has been beaten into self-censorship by massive fines and imprisonment. Hundreds of military officers have been jailed, some on evidence that they were plotting to overthrow the AKP, some on no evidence at all, along with academics, publishers, members of civil society organizations, rock-throwing Kurdish children, Kurdish grandmothers who held posters they could not read, and anyone who had the temerity to criticize the thin-skinned prime minister, even in a cartoon. The paradox is that the AKP received almost half the vote in the last election. One reason is the party’s spectacular success in improving the country’s economy and infrastructure. This has also permitted the country a new pride based on a vision of the nation as the offspring of the Ottoman Empire: We were once a world power, and we can be one again. Throughout the 20th century, since its founding in 1923, Turkey saw itself as a potential victim of outside powers aiming to undermine national unity and reconquer Turkey, a repeat of World War I, when Europeans dismantled the Ottoman Empire. Turkey’s non-Muslim minorities were treated with suspicion. The culture and language of Kurds and other non-conforming groups and individuals were banned and worse. The military had no compunction about staging coups to remove elected governments that it saw as representing dissonant views. After the AKP was first elected in 2002, it attracted voters from across the political spectrum who believed that the party would blend the widespread conservatism of the country with liberal changes and improved rights, especially freedom of religious expression (headscarves had been banned from universities) and freedom of speech. Indeed, AKP initially reinvigorated the EU accession process and passed a new penal code long desired by pious and secular feminists that improved women’s rights. The government stripped the military of the power to interfere in politics and reached out to non-Muslim minorities and Kurds, returning some confiscated properties and restoring changed Kurdish place names. But, like a rubber band after several years of liberal opening, the AKP has snapped back to what has long been the status quo of strongman autocracy, authoritarianism, patriarchy, and intolerance. These are characteristics that polls show are reflected by the population and characterize the still highly valued traditional family structure. But even an authoritarian father is expected to keep the welfare of his children foremost in mind. And that is where Erdogan has crossed the line. He dismissed the tens of thousands of citizens in the streets initially as purveyors of terror instigated by outsiders, then as “marginals,” as alcoholics, and finally, in perhaps the most revealing statement, as people who have an ideological gripe and who don’t like him personally. It is the grandiosity of power and the increasingly punitive state that has pushed people onto the streets and keeps them hanging from the windows of their homes every day, banging pots into the night. Even the revered father of the traditional family is expected to care about all this. But Prime Minister Erdogan, after insulting the protesters and refusing to acknowledge that there was any problem whatsoever, instead left for Morocco to attend a trade meeting. The function of the courts is to address the issue related to people and Government.If the people have problems then they should go to courts like the people of democratic countries It looks Turks live in forests. Hardly any forest left. Most of them have been nationalised and sold to one or other pressure group than sold to oil-spoiled customers to make up the economicaly blossoming facade of Turkey. I just hope that AKP with/without Mr Erdogan comes to its senses and start to be receptive of critisizms. I always thought that Erdogan was a mature and reasonable man and am appalled of the man before us now and kind of think that he may be under the side effect of some kind of a medication or is too tired to think properly. He still insist that this whole uprisal is fueled by some outsider group or the opposition party as if he is under a delusion that went out of hand. Well frankly speaking it was watered by the police cannons (if not fired). And the police keeps on doing it. Even if he was right in the beginning, he is proven wrong every day now. Every morning I wake up thinking that Erdogan is misunderstood and everything will be put right and I am proven wrong within one hour. He and his party may have done many positive things for Turkey (including the bringing up of these youngesters on the streets) but they just pulled it down the drain with just one wrong decision and added up to it by openly pronouncing political Islam ruling. Now I feel I have been under heavy pressure, lies, censorship, mistreatment, imparity and outright exploitation for a decade for which I have been trying to find excuses for for those who did it to me and my country. This is almost like being abused and the anger I feel will take time to ease. This is why Turkey is so angry. By the way please check Turkey's electoral laws before saying that the leading party had the majority of the votes. Folks, I have been listening to your voice but I think the time has come to take a step back and see the big picture. Stop dancing around this and that. The fact is, there is a culture clash in Turkey which has been a part of a systemic plan over years and Mr. Erdogan has found that treasure. Since then Ak party has mastered the art of how to use this power to their advantage, as a matter of fact very well. I feel for the Turkish public. They became a victim and indirectly supported an ugly agenda. Getting back to the big picture, AK party, whether you like it or not is on a mission to take Turkey to an islamic state and by the way, they are not so shy about it. They will use anything and everything to achieve this objective, little by little but securely. They know excatly what they are doing but they forgot one little detail – the other half of the culture. Please stop telling me this is what Turkey wants thanks to democratic elections. If you were to do an election in Afganistan what do you think the result would be? Does that mean the obvious outcome is the right choice for that county? I think we need to realize this fact and start promoting Turkey's educated, visionary young generation to over come this dark illeteracy which makes decisions about Turkey's future without a clue. Beleive it or not this is a fight for literacy, secularism and human rights. Ata I must unfortunatally agree with you. The kind of money flow invested in such countries is increadable. One do naturally think of thr pay-back. Another kind of banking system is working. And taking control on those under influence. By the way, thanks Fareed for providing a ground where Turks can freely talk. Agreed and very appreciative of that. My only condition though I really wish CNN had a better probe in Turkey. I think CNN credibility was shaken by a bunch of pinguins already 🙂 Please see my comments in last Sunday's GPS feed of Mr. Mustafa Akyol's pink picture report which I found cute and useless! .....many more lies to cant write here . Please react and save our children from his fury! Pls see what the protesters are! Turks are so angry because PM Erdogan is so angry!Never silence Erdogan is always provoking people.When he speaks he insults(saying alcoholics,vandals,marginals,peoples who drink in the Mosque,etc) or threatens(Not only protesters but also businessmen who show emphaty or give shelter to escaping wounded protesters are threatened).Everyday his intolerance to demonstrators inreased.On Sunday,50 thousand people is attacked by pepper sas and water cannons.Such a police violence is not acceptable.Turks are so angry because despite what they say,the ruling party has continuosly attacked lifestyles,the respected values of republic.Erdogan is acting like a dictator,he decides everthing including local affairs like Gezi Park.However his acts are always ideological in fact.He says'I have %50 support behind me so I will do everything I want!' That's not the democracy!